* I interviewed TheBenche.com's MD (November 2011). Last week, I had the opportunity to catch up with Hakan Aldrin, TheBenche.com's Managing Director, at Finextra's Social Media Day. It was a good timing as Hakan and his team were about to launch the newly re-designed platform, The Benche 2.5, focused on driving more discussions on the same day (7th April). SEB's online community now counts over 5,000 members and 20,000 monthly unique visitors. This morning I was plaisantly surprised to receive a news letter from Martin Björnström the new Content Manager at the Benche, the online community for trade finance professionals launched by SEB last year. * next time, please use whether "Christophe" or Mr Langlois" but not my username on the network, "christophelanglois"
* Could you please clarify the 1,500 'companies/members'? Does it means you have 1,500 registered members in total? Or many more members from a total of 1,500 different companies? At the end of the day, size matters but the amount of activity from your members is equally important. + SEB market 'the Benche' on its own asset: they display a 'the Benche' banner at the top on their "Corporate and Institutions" category page. Please note I covered it already in my Smart Marketing post back in March 2009. + I love the 'Ask SEB' section to tap the company expertise in trade finance and give more visibility to its employees. To the contrary, it looks like SEB still values the potential offered by this ambitious and innovative initiative. They are really trying to make of 'the Benche' a one-stop-shop for Trade professionals. It is not perfect, but I identified quite a few quick wins which would in no time take this initiative to the next level in terms of both member base and activity. I always insist on the fact that the quality of the interface is not important in social media (as long as it provides all the expected basic features) so don't blow all your budget on the interface. And don't spend huge amounts of money promoting your platform. Instead, you must fully leverage the most popular social media sites. If you do it right and if you managed to convince your influencers, they will be delighted to market your initiative on your behalf and for free. I am passionate about social media, and social media is all about people. In Visible Banking, I focus on Web 2.0 because I believe it gives banks an amazing opportunity to engage with their clients and show they care. During all my speaking engagements, I always make a point to remind the banks they must be honest, transparent and focus on people first. Banks must reward you for the time your spend on their platform, and give you a good reason to come back and spread the word. Thanks for spending a few minutes of your precious time to fill the questionnaire, and for spreading the word around you. On regular basis I will publish the most interesting comments on Visible-Banking.com, anonymously. If you accept to be quoted, I will also list your name, your company and promote your blog. It is also a unique opportunity to promote your favourite social network in banking and put it at the forefront of the social media scene. As a social networker, your feedback, your comments and your suggestions are extremely valuable. I invite you to contribute to my social media directory in banking. 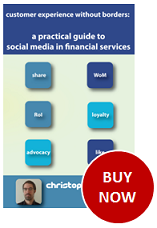 My goal for this page is to become The most comprehensive list of social media initiatives in banking and online finance. If you are not familiar with the award winning online community launched in 2006 by Vancity, Canada's largest Credit Union, I invite you to visit the changeeverything site today. This is a great example of how to engage with your community, to urge your members to contribute and promote your platform... for free. 1. Create a New Year's resolution by selecting one of the changes already underway at ChangeEverything.ca, or creating a new one. 3. Let us know about it. Make your entry official by tagging each blog post with the keyword "2009resolution" (without the quotes). Here's how you tag a post. This is really important otherwise we will not be able to find your entry. - ask a mentor or expert for help, and write about their advice. - find blogs and web sites that deal with your resolution's subject, and post on them asking for help. - find a way to make news about your resolution – in a community newspaper, on a talk radio show or the CBC national news. - video and pictures on the changeeverything site. - find other ChangeEverything.ca members who are working on the same change, and comment on their blog posts. Get a conversation going. - add photos to your blog posts. There wasn't much activity from me this week. I have been busy finalizing my presentation for the Retail Banking Innovations event which will take place in Singapore in 10 days. Nevertheless, I am delighted to confirm that the number of fans keeps increasing consistently. The page now counts 89 fans. 41. Maria Cabezas: I am not connected to Maria on Facebook yet, and it looks like we don't have friends in common. Maria, I invite you to send me an email to confirm your linkedin profile and your employer. 42. Toby Horry: same with Toby. I only found one Toby Horry on Linkedin, Planning Director at Dare in London. Toby, is that you? 43. Yonni Harif, Marketing Manager at WorkLight (USA): I shot a video interview with Yonni at FinovateStartup in April 2008. I invite you to check Yonni's twitter and visit WorkLight's Secure Entreprise2.0 blog. 44. Guillaume Thevenot, Business Development Manager - Hospitality at Amadeus UK & Ireland (UK): Guillaume is one of my best friends. I invite you to visit his industry leading blog on hotels and the hospitality industry, Hotel-Blogs.com. 45. Jesus Perez Sanchez (Spain): Jesus is connected to Fernando Egido Egaña from Caja Navarra. 47. Pol Navarro, Senior Director, Head of Innovation and Distribution Channels at Banco Sabadell (Spain): I met Pol a few times already in the UK and in Spain. 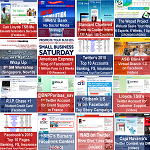 Pol is one of the very few Champions for Social Media in the banking industry. He already has an impressive track record at Banco Sabadell. Pol was one of the key speakers at EFMA's Online Financial Services 2007 in Barcelona last year. I invite you to check Pol's twitter. 48. Marc Oppenheim, Senior VP- Head of Retail Banking at LCL (France): Marc, je suis ravi de vous compter parmi les fans de Visible Banking. Vos commentaires sont les bienvenus. 49. Ludovic Philippo, Operations Manager at Expedia France (France): I invite you to visit Ludovic's "Net Promoter Score" blog. Prior to his role at Expedia, Ludovic worked 5 years in the banking industry. Ludovic worked for Marc who endorsed his job at LCL. 50. Aden Davies, Innovation Technician at HSBC (UK): Aden works in the Innovation team at HSBC, and I assume he works for Darren Armitage. I invite you to check Aden's bookmarks on Delicious. Two new responses to the Facebook question. Thanks Antonio and Aden for your contribution! Don't hesitate to contribute to the discussion board, and post your own topics.